When we left Fort Union Trading Post National Historic Site on Sunday, September 28, we drove directly to the north unit of Theodore Roosevelt National Park. The north unit of the park is located approximately 70 miles north of the south unit, which we had visited two weeks ago, but we did not stop on our way to Fort Union. Now we would have time to explore this section of the park. I think we must be cursed when it comes to rain in Theodore Roosevelt National Park. It was cold, and rain was in the forecast when we arrived at the park, and we checked into Juniper Campground. The campground has no hookups, not an ideal situation for this type of weather, but we thought we could tough it out. Besides, the location along the Little Missouri River was great, and we had few neighbors. One of the main features of the park is a 14-mile scenic drive that ends at the Oxbow Overlook of the Little Missouri River. Although it was late afternoon when we arrived and the sky was a bit gloomy, I decided to make the drive and check out a few of the pullouts and overlooks. The north unit of the park showcases the badlands of North Dakota and the unique geological forces at work. One of my favorites was the cannonball concretions. 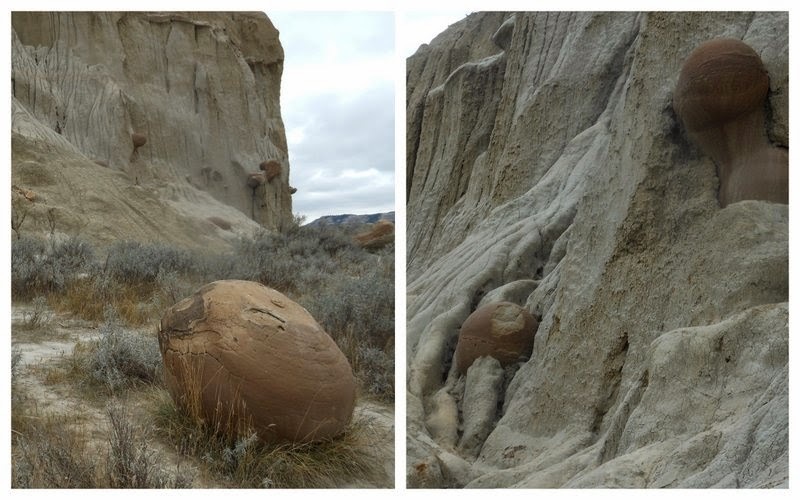 Concretions are large spherical boulders that are formed within rocks by the deposition of mineral around a core. I just thought they were very cool looking. The weather was rapidly deteriorating when I stopped at the River Bend Overlook on my way back to the campground. I loved this view, perhaps because of the addition of a stone shelter constructed by the Civilian Conservation Corps. Tim and I made it through the night and ventured out the next morning to try for a few hikes before the rains came. We checked out the Caprock Coulee Nature Trail, but had to turn back after about twenty minutes when a very unfriendly-looking bison appeared a little too close to the trail. The close-up view of the rock formations and local geology was the highlight of this hike. Tim disagrees. He thinks the highlight was the bison! We drove to the end of the road, where we were able to take a look at the Oxbow Overlook. We debated about hiking to Sperati Point, which leads to an even more spectacular view of the oxbow. Tim said, “Let’s go,” and off we went, grateful for our warm hoods and gloves. The view at the end was worth it. Because of the weather and lack of electrical hookups, we had planned to spend only one night in the park. But we were tired and lazy when we returned to the campground and extended our stay for another night. We turned on our propane furnace, fired up the generator as needed and watched the rain from inside our cozy home. Being able to change our minds and go with the flow is one of the best perks of the full-time lifestyle. It was still raining when we left the next morning. Perhaps we should consider ourselves lucky that we were able to experience some of the 15 inches of precipitation the park averages per year. On second thought, I must admit that I would have preferred sun. The park was lovely, and there was somewhat of a dreamy quality to it. However, someday I hope to see it when the sun is shining.